Boise, Idaho was not high on my travel bucket wish list. But when Kirsten Furlong, Gallery Director at Boise State University, asked to host an exhibition of mine I happily said “Yes!” Organizing international poster shows is a personal passion which has led to visiting some far-flung cities, including Havana, Tehran, Moscow, and Istanbul. The Seattle-Istanbul Poster Show, a city-to-city exchange featuring works by designers and illustrators from the Northwest U.S. and Turkey, was curated by myself and Ardan Ergüven, professor and Chair of the design program at Marmara University. Our show premiered at the Marmara University Republic Museum, next to the Hagia Sophia, December 1st, 2016. The U.S. version opened January 2018 at Boise State University’s Visual Arts Center, and the closing was timed to coincide with the 7th annual Treefort music and arts festival. The exhibition highlights a number of young designers from both countries, including BSU graduates Julia Green and Kyler Martz, alongside established professionals. I’m always happy to talk to students about my exhibitions, so a gallery talk aimed at BSU students and an opportunity to be part of a Treefort panel discussion on “art, design, and music” sealed the deal for me to visit. More surprising, however, was that my Turkish co-curator agreed to travel to Idaho from Istanbul. Ergüven had never been to the U.S.—much less heard of “Boise” or “Idaho”—but he was excited about visiting the Northwest and seeing the next iteration of our show. So, after flying halfway around the world, Ardan arrived in Seattle and gave a talk at Tether about Turkish graphic design—from İhap Hulusi Görey to Sarp Sözdinler—before we traveled on to Idaho’s capitol. Treefort turned out to be an ideal opportunity to visit, with events at venues scattered across town, from concerts to readings to performance to beer tasting. It was an eye-opener to find Boise is one of the fastest growing cities in the U.S., one that’s extremely walkable and stocked with Basque-inspired cuisine, quality coffee, and support for the arts. Our excellent host Furlong arranged two speaking engagements and we found the audiences to be wonderfully engaged, asking many questions about our project, especially at BSU’s Visual Arts Center. Our visit culminated with “Sound and Vision,” a panel discussion covering art, design, and music at The Owyhee in downtown Boise. The conversation was wide-ranging, covering everything from real world career expectations for graduating design students, to creative resistance, engagement and “reinforcement” (“forts” were on our minds) in the era of Trump. Another important theme was building cross-genre and cross-cultural connections via events like Treefort and the role universities can play in facilitating them. The conversation resulted in a pledge between BSU Design Professor Brian Wiley and Marmara University Professor Ardan Ergüven to explore a silkscreen print exchange between students at their schools, and hopefully, an eventual in-person exchange. It was gratifying to see an unlikely connection between Istanbul and Idaho spark ideas that may lead to deeper, future connections. 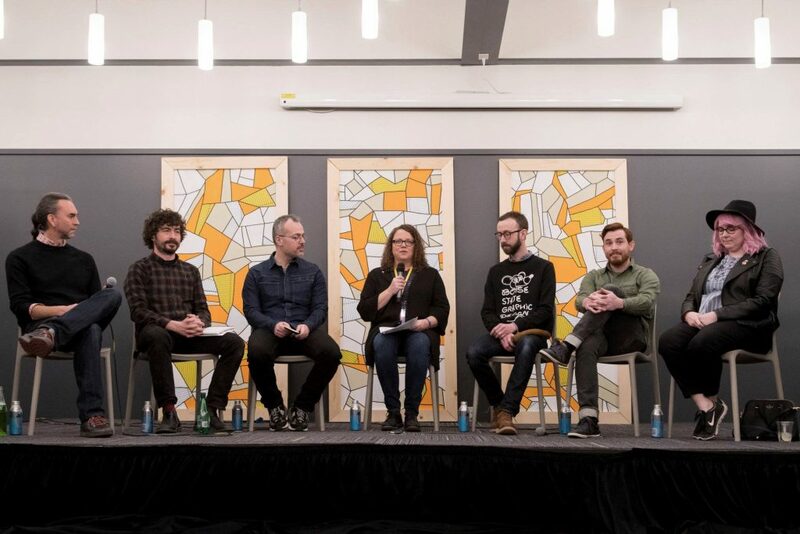 Sound and Vision: A Panel Discussion About Art, Design, and Music was held March 23rd, 2018, at The Owyhee, Boise, as part of Treefort 2018. Participants included, left to right: Daniel R. Smith (Creative Director Tether/Design Curator Seattle, WA), Brian Gorman (Musician/Educator, San Francisco, CA), Ardan Ergüven (Designer/Professor, Istanbul, Turkey), Kirsten Furlong, (Gallery Director, Boise State University), Brian Wiley (Designer/Professor Boise, ID), James W.A.R. Lloyd (Illustrator, Boise, ID), Julia Green (Illustrator, Boise, ID).